This week the Ligularia is blooming beautifully in my garden! Rocket Ligularia (Ligularia stenocephala),also known as leopard plant, can be grown for its nice foliage, as well as beautiful yellow flowers which just started blooming. The particular cultivar that I grow is 'The Rocket' but several are available on the market. 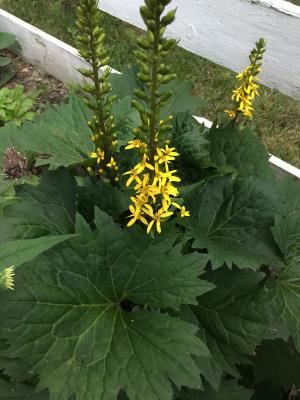 This particular Ligularia is a clump-forming perennial with a mounded habit with large, triangularly heart-shaped leaves that are attractive even with not in flower. The flowers are the real attention grabber through. Small, bright, yellow, daisy-like flowers open in dense racemes in mid-summer on thick, purplish, alternately-leafed flower spikes towering above the foliage to 4'. Missouri Botanic Garden notes Rocket Ligularia as best grown in rich, humusy, medium to wet soils in part shade to full shade in a location sheltered from winds. In times of dryness like we're experiencing right now, this perennial benefits from a regular, deep watering in hot summers.The Ligularia in my garden is in a fairly sheltered, shady spot and does very nicely. My site is not overly wet either, and it still tends to thrive! 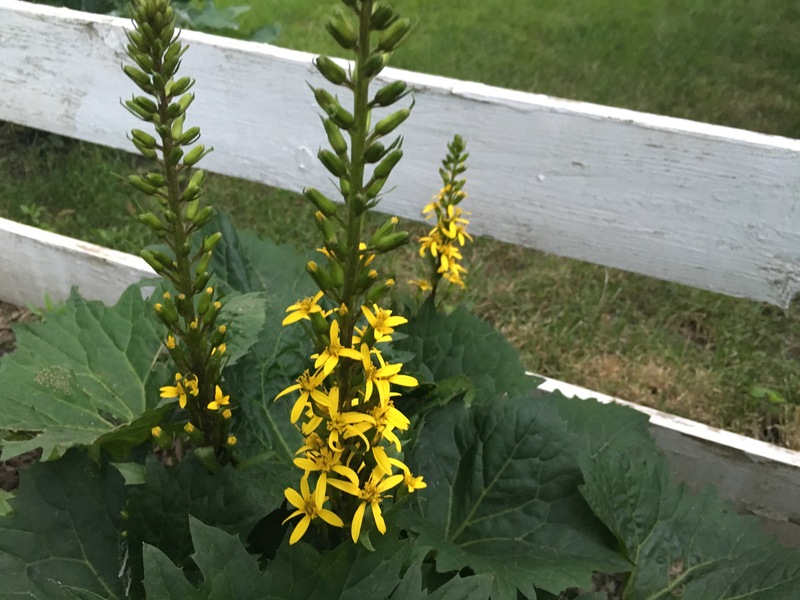 If you're interested in learning more about the various Ligularia species, Chicago Botanic Garden has a great article about the species they trialed on site. Learn more about perennials for moist to wet soils at our Beyond Impatiens and Petunias website.